I am obsessed with water; I want to maximize, as much as possible, every bit of rain. The realization that 1" of rain, falling on 1,000 square feet of roof = 600 gallons of water is worth spending some time thinking about. When I began looking at the pros and cons of large greenhouses, the recurring negative comment was always the "soup" that ended up surrounding the structure as a result of our spring rains. In permaculture, the bi-line of "the problem is often a solution" kept ringing in my head. How to capture the massive amount of rainfall without the unplantable moat that develops? I came up with the idea to dig around the outside of the greenhouse and install inlets, spaced approximately 25' apart, from the outside ditch, under the base of the greenhouse, into a sister ditch inside. The interior channel slopes and turns, directing the water down a center path and spreading into adjoining channels flanking all of the raised beds. At the far end of this maze is a fairly large tunnel (approx 8" across) that runs from the inside to the outside, under the end wall, allowing us to evacuate excessive water, which is then directed to other beds. This tunnel is simply blocked with a board of wood to keep water inside or the board is removed when torrential rainfall occurs. This was our first test of the system after installation. 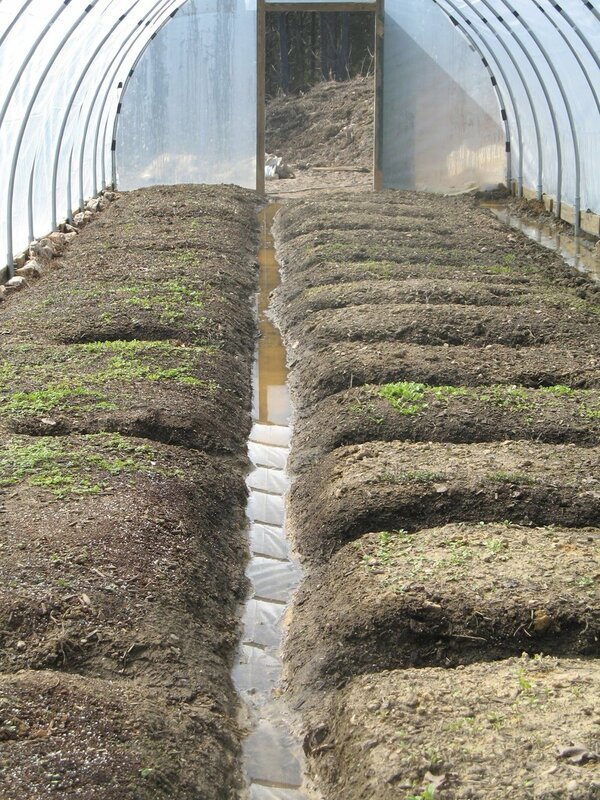 This system provides the important deep slow soak that plants thrive on. Granted, when we seed these beds, we have to hand water until the roots are established enough to seek out their water. The house's first fall and initial seeding is taking hold. The beds, configured in a keyhole layout, maximize planting surface, and the channels second as pathways for ease of harvest. The beds were sculpted years ago and have held their shape beautifully. There is bi-annual maintenance of the paths or channels since they do warp, if you will, with the regular flow of water. For several years, this system has proven to be a huge success. We plant in very late fall and enjoy constant harvests through the spring.